A few weeks ago I posted Modifying Commercial Sewing Patterns to Suit Sweater Knit Fabrics. At the end of the post I nominated Sewaholic's Renfrew Top as "an excellent candidate for a sweater knit fabric." Well, I've done it! Not with the fabric pictured in that earlier post, but with my Moonstone fabric in sky blue. I chose the Renfrew, because it fit my two criteria. First, it was designed for knits. Second, it's a basic design. To top it off, the Renfrew was voted the #1 Best Pattern of 2012 at Pattern Review. This gave me lots of confidence to work with this particular pattern, as I don't have much recent experience with commercial ones. I'm not the ideal body type for Sewaholic patterns. They're designed for "pear-shaped women"; I'm more rectangular. Turns out it was simple to adjust, a delight to sew with clear instructions, and I love wearing the top! As stated in my earlier post, the first thing that must be modified is the layout. 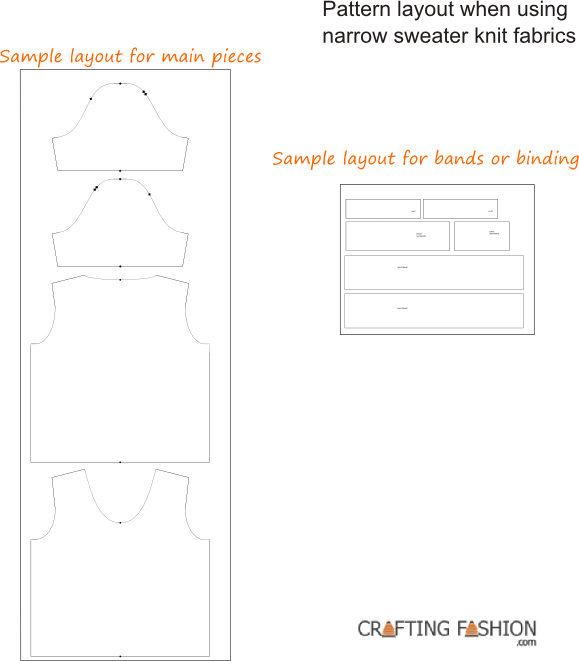 As artisan fabrics are generally narrower than commercial fabrics, I used what's become my standard layout for tops. This placement is for the ribs running vertically and the greatest stretch in the horizontal direction. (For the record, this is the opposite of how I laid out the original Moonstone.) Also, I didn't want lacy fabric for the bands and so I ended up using two fabrics -- the lacy one for the main pieces and a plain jersey in the same color for the bands. This is the standard layout I've used for several sweaters on narrow fabric. Tip: Do not allow any fabric to hang over the edge of the table. It will stretch the fabric. As you can see, I never place any pattern piece on a fold with sweater knit fabrics. I really want to match textures or patterns evenly and there is so much more control laying the pieces out flat. For the Renfrew, I cut whole pieces out of banner paper first, then laid out these banner paper pattern pieces on my fabric. I admit to finding it easier working with the heavier paper than the tissue paper pattern. Because my band fabric (available by special order) was also narrow, it was necessary for me to cut the waistband in two separate pieces. I added a seam allowance, where I would make the new side seam. I did the same for the neckband, making sure the seams would be at the sides. It wasn't necessary to add seam allowances for the neck band; you'll see why below. After cutting all the pieces, I stabilized the edges with Super Solvy. An alternative method of stabilizing the edges would be to serge or zigzag the edges of all pieces immediately after cutting and before sewing. If using a serger or sewing machine, be sure you've made all adjustments to differential feed (for the serger), tension, and stitch size ahead of time, so that you do not stretch the edges. A walking foot for the sewing machine is highly recommended. The following sentence may shock the regular readers of this blog. I used transparent elastic to stabilize the shoulders! I, who swore I wouldn't use that stuff again (at least for a little while), used transparent elastic without any problems whatsoever! Since the fabric is lacy, I didn't want to chance using the recommended twill tape, which might show through the openwork fabric. One major modification I made came when I attached the neckband. With the soft stretch of a sweater knit, one usually reduces length of the neckband considerably in order to "snug up" the neckline. Rule of thumb has the unstretched neck band at 75% to 80% the size of the neckline. Though the neckband for View A is already smaller than the neckline, I ended up cutting 2 inches from the neckband to be sure the neckline would lie flat. It worked well. From the reviews I've read of this pattern, I'm sure this modification isn't necessary with a more stable knit. 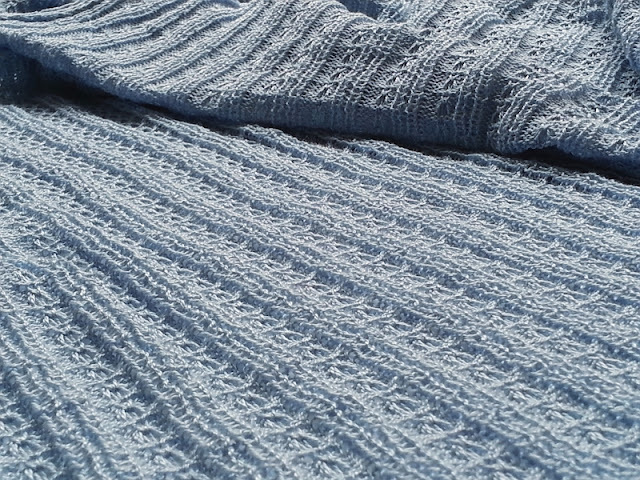 With a few easy modifications, most basic commercial patterns designed for knits can be used with the heavier, or lacier, less stable sweater knits. The Renfrew Top works amazingly. And remember, because wool is so much easier to work with than cotton, there are lots of wonderful possibilities for fabulous winter sweaters! Disclosure: Affiliate links appear in this post. It looks beautiful. I have been wanting this pattern since it came out, but haven't purchased it yet because I am not pear shaped either. I have an inverted triangle body type and need a full but adjustment on everything I make. I've never done it on knits before. So it's basically my nerves that are stopping me. Thanks, Jennifer! My alteration was a relatively easy one. I always get nervous before the first cut, however. All the best! You did such a beautiful job on this top. Thank you for all of the great information on working with sweater knits. I have some beautiful sweater knit fabrics that I bought a while ago but have been afraid to work with. You've inspired me to sew up some sweaters. Thank you, Dianne. I'm so glad you're finding this blog helpful. All the best with your future sweater sewing. Enjoy!